Does your high school have Driver's Education? Either way consider Cascade. 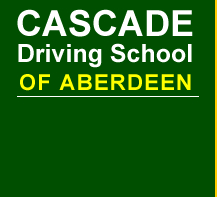 We periodically provide branch driver's education courses at high schools throughout Grays Harbor, Pacific and Jefferson Counties. Contact us for details. Before you can get a permit or take an exam, you must establish your Personal Identification Code with the dol. To do so electronically, preapply (http://www.dol.wa.gov/driverslicense/preapply.html) on their website. The dol has provided many resources for parents and teens: books, pamphlets, videos, etc. We encourage you to carefully peruse their website at dol.wa.gov; please obtain your personal paper copies, if desired, of current resources at the dol office. The Driver Guide (http://www.dol.wa.gov/driverslicense/guide.html) and Parent Guide (http://www.dol.wa.gov/driverslicense/docs/parentguide.pdf) are also available in electronic format. Some parents find advance access to the parental affidavit (http://www.dol.wa.gov/forms/520003.pdf) to be beneficial. The dol has provided electronic resources for exam applicants. We encourage you to carefully peruse their website at dol.wa.gov; please obtain your personal paper copies, if desired, of current resources at the dol office. The Driver Guide (http://www.dol.wa.gov/driverslicense/guide.html) is the basis for the knowledge exam. Information, in written and video format, is also available about drive exam (http://www.dol.wa.gov/driverslicense/drivingtest.html) expectations. We strongly encourage you to make use of these resources. This is NOT the exact template we follow. However, it is time-tested and may well help parents in preparing for instructing their teens. It is provided with no implied liability on our part.